The Felikhorn is barely discernible as a summit. The inconspicuous peak lies beside the Felikjoch, the highest crossing in the Alps. 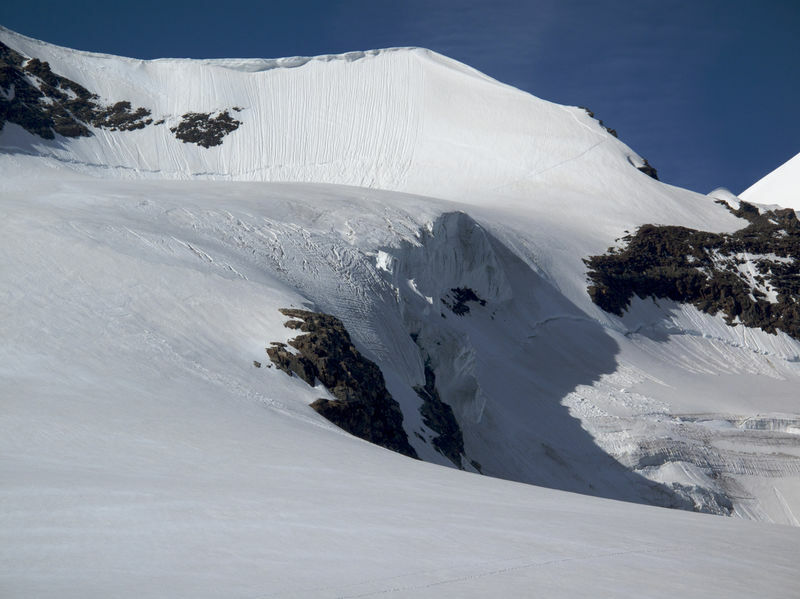 The Felikhorn is an inconspicuous 4,000-metre peak. It is located south-west of the Felikjoch, which can be reached in three hours from the new Monte Rosa hut or in one and a half hours from the Quintino Sella refuge (Italian Alpine Club, CAI). The Felikjoch is the highest crossing in the Alps for mountain tours. It connects the Matter valley to the Val de Gressoney, and links the new Monte Rosa hut with the Quintino Sella refuge via the Zwilling and Felik glaciers. It is especially useful for those who want to climb the Castor or the Liskamm from the Quintino Sella hut.